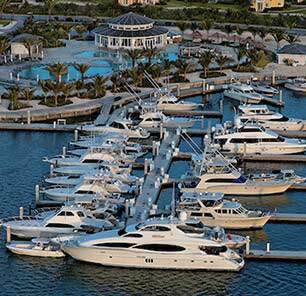 Located on North Bimini Island 60 miles east of Miami, Florida in the Straits of Florida. The world-class Resorts World Bimini Casino is a 10,000 square-foot, live-action casino that features popular tables games with competitive table limits including Baccarat, Blackjack, Craps and Roulette, more than one hundred slot machines, a high-limit private gaming salon and a Sports Book. With floor to ceiling windows, it is the first casino in the world to have panoramic water views, and has a full indoor-outdoor restaurant that sits directly on the Mega Yacht Marina. Guests can essentially sail right up to the casino doors. With over 140 machines with denominations ranging from $0.01 all the way up to $100. You can win jackpots up to $100,000! Amicci's Pizzeria & Gelateria - An intimate Italian cafe, Amicci's features menu items such as fresh Paninis, assorted homemade gelato flavors, coffee drinks, pastries, gourmet pizzas and salads. Amicci's is a great place to grab a meal at any time of the day. Whether you're returning from the beach or picking up a snack before an excursion, Amicci's is perfect for a quick meal. Open daily. Proudly Serves Starbucks. Dress Code: Casual, Swimwear acceptable. Aqua Grille - Aqua Grille is set on the serene Infinity Pool overlooking the beautiful Atlantic Ocean. Enjoy a casual lunch or dinner and sip your favorite cocktails while taking in one of the island's most incredible views. Open daily for lunch and dinner. Inquire about dinner schedule and availability for private events. Dress Code: Casual and Swimwear during lunch; Island Casual during dinner. The Healing Hole - The Healing Hole is a dockside, open-air restaurant and sports lounge serving a variety of freshly grilled Bahamian favorites. It is the go-to place for tropical cocktails and cold beers on tap and beautiful marina views. The Healing Hole features local entertainment every Friday and Saturday evening. Dress Code: Casual, Swimwear Acceptable. RW Hemingway's - Located inside the Resorts World Bimini Casino, RW Hemingway's serves up an eclectic mix of Bahamian and American fare in a sports-bar setting flanked with LED TV's & open during Casino operation hours.